Daughter said that its better than the cream and works fast too. No more red itchy spots. Wow. I'm amazed. All I know about VCO was that my hubby use it for his hair. Luckily, I have a red itchy spot on my arm just now so I got to try the VCO. And it really worked fast- less than 5 minutes and the red and itchy spot is gone. No kidding. I think this is quite easy to find since most malls have Carica stalls. And I'm pretty sure other VCO brand work wonders as well. This 100ml spray-bottle costs about P150. I find this VCO amazing and I guess it is not harmful to the skin and the environment since it is a "natural" product compared to the "anti-itchy" cream that I used to buy in the drugstore. The cream also emits some "chemical" smell that may be harmful if inhaled frequently. 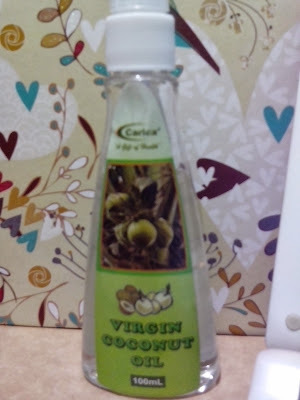 I'm glad hubby discovered VCO for his hair and applied it by accident on his hand when an insect bit him in the garden. Two thumbs up!